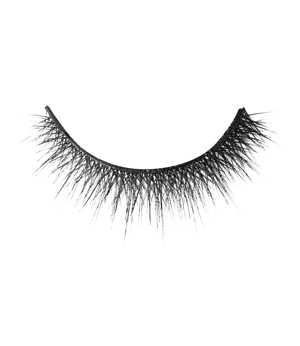 JAPONESQUE® Criss Cross Wispy Lashes are designed to create light, feathery and glamourous eyelashes. Each synthetic fiber is thicker at the roots while tapering to the tip. Apply glue to lash band at the base of lash set. Easy-to-see glue goes on white and dries clear. Wait 10 seconds. Position lashes just above natural lash using the Japonesque Lash Placement Tool. Smooth base and hold in position until set. Grasp outer edge of lash set. Gently peel lash toward nose. For easier lash placement use the Japonesque Lash Placement Tool. Store lashes in anti-bacterial base included with the Japonesque Lash Placement Tool. I like the dramatic look it gives to my eyes. Also, I have very small eyes and everyone has told me that my eyes look very big and exotic with them on.